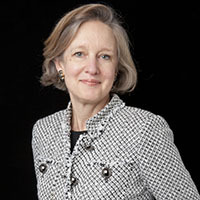 Becky MacGuire joined Christie’s in 1990. Her background is in the decorative arts with a special expertise in the China Trade and Chinese export porcelain. Mrs. MacGuire’s responsibilities include the appraisal of China trade porcelain and paintings and the formulation of Christie’s annual sales of Fine Chinese Export Art, which have come to dominate this market. Important collections Mrs. MacGuire has won for Christie’s include The Benjamin F Edwards III Collection, The Leo and Doris Hodroff Collection, The Hon. Peter HB Frelinghuysen, Jr Collection, and Mandarin and Menagerie: The Sowell Collection. Mrs. MacGuire is also Sale Director of The Exceptional Sale at Christie’s New York, an annual sale of decorative arts masterpieces which has drawn major museum participation and set numerous auction records. She earned a B.A. in art history at the University of California at Berkeley and studied at The Study Centre for the Fine and Decorative Arts, the Victoria & Albert Museum, London. A frequent lecturer and former participant in The Antiques Roadshow, Mrs. MacGuire was also founding chairman of the International Antiques Show opening party for the benefit of Memorial Sloan-Kettering Cancer Center.